A Class 2 Mean Well brand UL Recognized Constant Voltage LED Driver with a universal AC input of 100-240VAC and a 12VDC output of 1 amp or 12 watts. An IP30 rating is suitable for dry locations only and capable of supplying power to 11 watts of 12VDC Constant Voltage LED lighting product. Use this LED transformer to connect 12VDC LED Modules, LED Lights, LED Light Ribbons, RGB LED lighting and other LED Lighting products. UL recognized and CE approved. 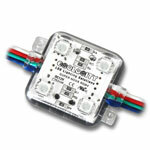 This LED backlight module is a truly unique product. When your project calls for a light with a small form factor and physical imprint look no further than our Dwarf Star 1 module. 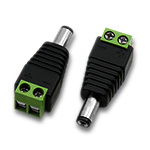 This product easily conforms to linear, circular or curved layouts with a max serial connection of 50 modules. 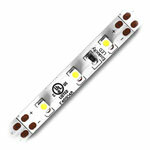 Don't let the small size of this LED module fool you, it is more than capable to handle all your lighting needs with a max output of 0.24W per LED chip. 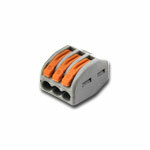 The Dwarf Star has the ability to be cut at the lead wires between each module for ultimate tailoring to your project. This tiny powerhouse module is ideal for channel letter, halo lighting, sign lighting, accent and cove lighting, under cabinet lighting, hobbyist lighting, model architectural lighting and many more projects! 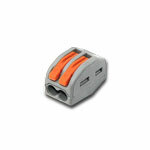 A constant voltage DC power source is needed to power this product. The plastic ABS shell and clear epoxy coating provides limited water-resistance to moisture. Not submersible or UV proof. 110V Wall Plug Cord - Two Prong - 6ft. 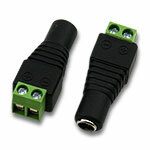 A two prong 110V wall plug power cord for LED Power Supplies. This cord is used to connect a power supply to a 110 volt outlet. Approximately 6' long, 2 prong, 2 wire. Rated for 125V AC maximum. 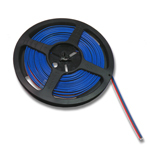 Plug is polarized for use with NEMA 1 and NEMA 5 type receptacles. 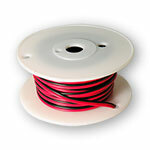 The wire with several ridges on outer plastic coating is Neutral, the opposite wire is Load (Hot, Live).